The rich creamy texture combined with a wide range of vibrant colors make these paints a favorite among instructors and professionals. * Each color is comprised of pure pigments and refined linseed oil tested several times throughout the manufacturing process. * The result is consistently smooth brilliant color with excellent performance and permanence. 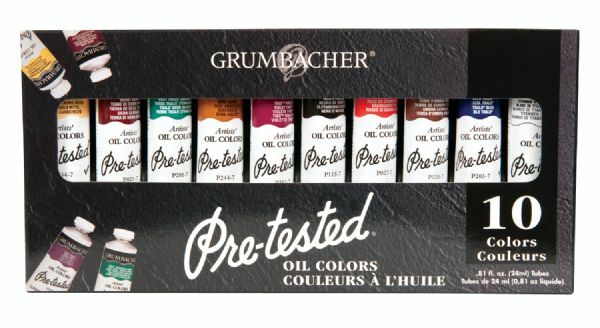 * Set contains 24ml tubes in 10 colors: Burnt Sienna Yellow Ochre Cadmium Red Light Hue Cadmium Yellow Medium Hue Ivory Black Thalo Blue Thalo Green (blue shade) Thio Violet (magenta) Burnt Umber Titanium White. 9" x 4.2" x 1"